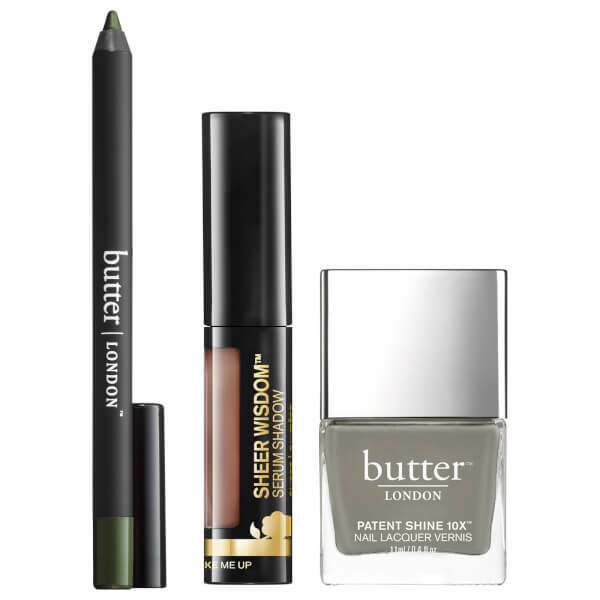 The butter LONDON Khaki Set combines three must-haves for professional-looking results. The kit includes a precision eye pencil, a unique serum eyeshadow and a long-wearing nail polish with a high-gloss finish. An ultra-smooth eyeliner that glides effortlessly across the lid, without pulling on the delicate skin. The eye pencil arrives with a sharp point that can be used to produce clean and precise lines to enhance the eyes. The smooth formula can also be smudged and blended out for a smokey and sultry-looking finish. Once applied, the long-wearing eyeliner sets firmly into place to ensure eyes remain flawlessly defined all day, however busy your lifestyle is. Delivering a neutral hue with satin-matte finish, the eyeshadow contains a blend of anti-ageing peptides to help improve the appearance of wrinkles, and Spherical Polymers for a smoothing effect. Gliding effortlessly onto lids, the uniquely textured eyeshadow transforms from a fluid serum to a light powder, imparting high performance pigments with a subtle wash of colour that resists creasing for a flawless, natural makeup look. It blends easily and adheres seamlessly to the lids. Perfect worn alone or as a primer for other eyeshadows. A fade-resistant, fast-drying warm grey crème that applies effortlessly to deliver chip-resistant colour with a gel-like cushioned effect for up to ten days. Fortified with patented Shock Resistant Polymer Technology to prevent chipping and peeling, its unique formula coats nails in long-wearing colour with mirror-like shine, whilst its dense curved brush applicator allows full coverage for a professional finish. Infused with Bamboo Extract and Diamond Powder, the nail varnish promotes smoother, stronger and healthier nails with every use. Free from Formaldehyde, Formaldehyde Resin, DBP, Toluene, Camphor, Ethyl Tosylamide, Xylene and TPHP. Eye Pencil: Apply along lash line and immediately blend as desired for long-lasting, all day wear. Shadow: Shake well and apply three small dots along the lid, blend completely. Add a second layer if desired. Nail Lacquer: Apply one coat of lacquer, let dry. Apply second coat. No base or top coat needed. Eye Pencil: Isododecane, Synthetic Wax, Hydrogenated Polydicyclopentadiene, Mica, PEG/PPG-18/18 Dimethicone, Polybutene, Glyceryl Tribehenate/Isostearate/Eicosandioate, Nylon-12, Polyethylene, Perfluorononyl Dimethicone, Polyglyceryl-4 Diisostearate/Polyhydroxystearate/Sebacate, Synthetic Beeswax, Pentaerythrityl Tetra-Di-T-Butyl Hydroxyhydrocinnamate, Copernicia Cerifera (Carnauba) Cera/Wax, CI 77491 (Iron Oxides), CI 77492 (Iron Oxides), CI 77499 (Iron Oxides). Shadow: Isododecane, Aluminum Starch Octenylsuccinate, Polymethyl Methacrylate, Dimethicone, Cyclopentasiloxane, Talc, Hydrogenated Polycyclopentadiene, Kaolin, Trimethylsiloxysilicate, Glyceryl Tribehenate/Isostearate/Eicosandioate, Hydrogenated Styrene/Isoprene Copolymer, Dimethicone/Vinyl Dimethicone Crosspolymer, Silica, Polybutene, Disteardimonium Hectorite, Tocopheryl Acetate, C12-15 Alkyl Benzoate, Tribehenin, Ceramide NG, PEG-10 Phytosterol, Lactic Acid, Palmitoyl Hexapeptide-12, Titanium Dioxide (CI 77891), Iron Oxides (CI 77491), Iron Oxides (CI 77492), Iron Oxides (CI 77499), Ultramarines (CI 77007). Nail Lacquer: Butyl Acetate, Ethyl Acetate, Isopropyl Alcohol, Nitrocellulose, Tosylamide/Epoxy Resin, Acetyl Tributyl Citrate, Benzophenone -1, Styrene/Acrylates Copolymer, Stearalkonium Hectorite, Malic Acid, Citric Acid, Bambusa Vulgaris (Bamboo) Extract, Ethyl Trimethylbenzoyl Phenylphosphinate, Diamond Powder, Polymethylsilsesquioxane. May Also Contain: CI 77891 (Titanium Dioxide), CI 19140 (Yellow 5 Lake), CI 15850 (Red 6 Lake), CI 77266 (Black 2).